Sred: well spark, you win 156 mins and i have hung up. Not great, and like I alluded to before , really comes down to appropriate resourcing. No one should be waiting close to 3 hrs on hold.... pretty ridiculous. if you were on your phone, were you not asked if you wanted a call back? every time ive called from a mobile ive been asked that, they even tell you how long the wait is expected to be. Have been in daily contact with Spark (cheers tdgeek) who have been in contact with Chorus. Seems they (Chorus) feel everything is okay at their end ..."sigh... a not my fault or issue situation"
While I appreciate the help, really jaded with what should have been an exciting transition. 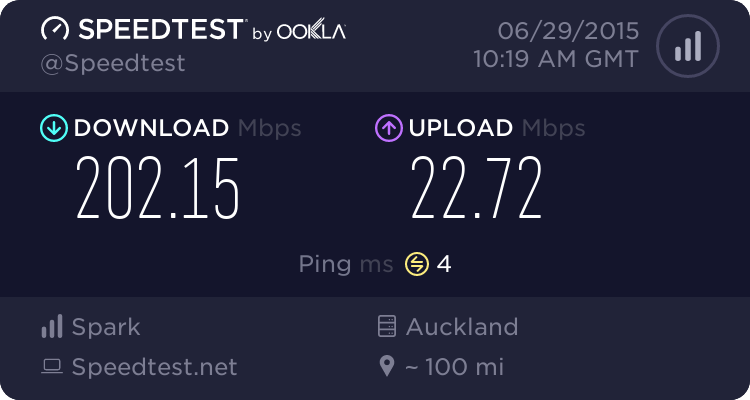 Interestingly using the ookla speedtest site (not the spark one) it seems to be showing my location as Auckland (I'm in Rotorua) - does this indicate a possible issue, for those of you more knowledgeable ?? First a big thanks to the Spark team / forum lurkers on Geekzone... tdgeek , BarTender and the rest of the people who have rung me and pacified me over the last 10 days. An old (and i mean old)windows 7 toshiba is giving a consitent and solid 201/21.....the plan speed is there. I'm sure there are many technical reason why the newer 8.1 pc is not giving the speeds - but I'm not going to lose sleep over it now (be good to learn why though). Maybe / hopefully windows 10 will sort it out ? 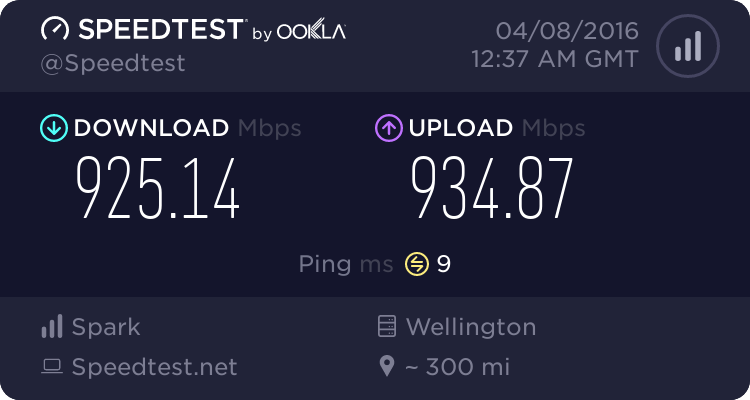 were you getting the slow speeds over ethernet or wifi? I signed up maybe 9 days ago now and I'm still awaiting for Spark to even give me a date on when they can give me service. Yes Orcon know that I'm transferring services but waiting an hour today on the phone for customer service is not exactly ideal today. Is there a Spark rep here that can give me an update? If it helps my issue sat with my ethernet network adaptor (i.e could handle up to 100 - not the 200 I was getting) - and yes it was a relatively new Lap-top , but they (HP) had cut cost with some of the build bits :) - pays to check !! Some one more technically astute on here may be able to explain why..
You could also while in devices to make sure the drivers for the adaptors (ethernet and wirless - if you have it) are up to date. I am confident the issue lies with the fibre provisioning and not my systems. As mentioned, I was getting a speed of around 90 MBPS on my earlier plan of 100 MBPS + Copper line. The speed dropped to only around 40 MBPS after the so called "upgrade" to a 200 MBPS line. I have therefore asked Spark to revert me back to the 100 MBPS line which I am told will happen in 2 weeks time! Yeah im pretty much over spark. internet goes down from 8:52am till around midday yesterday and it looks like I'm on 100/20 rather than 200/20. Oh yeah I requested the plan change on the 22nd may when they came out. Again on the 8th june when my fiber was installed and called every day since then because people keep telling me they will call back and they never do. A+++ company would definitely recommend to no one. 95 minutes speaking to people to be told it's not being done any time soon. I refuse to pay $600 in termination fees (I have 2 connections) and what options do I have left? I've tried facebook, I've tried here, I've tried making official complaints, I've tried calling, I've tried every available means of getting this sorted. This is getting pretty stupid at this point. BarTender to the rescue again. Chased up the problems and we appear to have progress! Sitting at about 130/20 but I assume it will take a day or so to settle. Thanks heaps mate! Glad to finally have this sorted. I am looking at moving my business connection to Spark (on a business connection) but these latest posts do not enthrall me. This on top of asking on Tuesday via their online contact page if they provide static IP and then being called the following day by someone who said I see you have asked about static IP, I said yes whats the story, she said dont know I will get back to you??????? Still trying to work out why she called, probably to get the response time numbers up? At least its given the office a laugh.